FlGoTSMATCHED VENEERS FREQUENTLY OF PARE WOODSo and not structural in character, it must be kept subordinated and not too conspicuous. 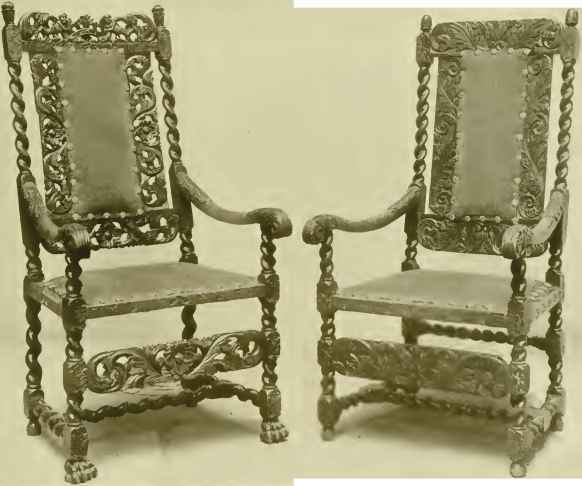 In period furniture, this type of enrichment would be called carving, moldings, and so on; but, in modern design, plastic enrichment designed to become an integral part of the mass, is formed by allowing small areas of space to penetrate the volume, and does not have the "stuck on" appearance of certain enrichment of the more ornate French and other styles. Plate 13 gives the effect of the plastic ornament to which we are referring; while Plates 10 and 11 represent the first group or surface enrichment. Contrast the plates and get the feeling of the different types. The increasing use of glass in construction. Its glittering and clearly marked planes bring a vitality to the darker corners of the room, while its reflections pick up colors, lights, and angles. Also structurally, it is fireproof, acid and waterproof, and is readily cleaned. With three modes of enrichment in mind with their two subdivisions and, with the knowledge of structural characteristics, let us now study Figure 65, Plate 8, obviously a low container for magazines and small objects. As a deeply penetrated plastic project, with interesting light and shade, there seems to be little or no need for extended enrichment. It seems better taste to restrict enrichment to Mode 1 by bringing out the qualities of wood through the finest of craftsmanship and finish. As the object is a horizontal volume, with its spaces and masses designed to support this theme, use Mode 2 to accentuate the prevailing thrust. Mode subdivision A, Surface Enrichment, predominates the pattern. Sharp corners give undue severity, while the ninety-degree or right-angle corner holds the attention too long, tending to check the full enjoyment of the horizontals, which are prominent features of this design. By rounding off the front and rear edges, the horizontal movement of the thrust pattern is accentuated, and the softened result adds to the general beauty without becoming effeminate. The remaining right angles are not objectionable and, by their duplication throughout the design, give harmony through unity plus a certain vigor in sharpness. Structural and constructive characteristics are plastic in that they support successfully the growth and flow of movement, without becoming too obviously constructive. Figure 66, Plate 8, a slightly penetrated, almost "roughed-out" design, has little plasticity, at least as compared with Figure 65. Functionally, its services as a sealed container differ from Figure 65 and its pattern would therefore appear less plastic. The wood grain of Figure 66 gives the upward thrust to the pattern, Mode 2; while Mode 3, relieving the monotony of plain surfaces, calls for the introduction of sharp moldings, made by slightly sinking the main mass in blocked-out plasticity. Thrust balance is augmented by appendages and moldings, while the black top, enamelled or in bakelite, balances in tone the floor shadows. In Figure 67, we have the effect of extensive piercing of the volumetric casing with its enhanced plastic qualities and lightness. This type of design, with its tendency towards curvature, harmonizes with period furniture possessing simple curvature in contours or outlines. Figure 68 points out the trend in appendage design, and it may be said that, in details such as these, much ingenuity has been and will be shown in future designs. There are many ways of opening doors and drawers; knobs and handles of tradition are not necessarily the last and only answer; and the beginner can well try his skill at creative designing in this field, taking care, of course, to make the drawer or door pull completely functional.